Finally Apple has released iOS 12 stable. iOS 12 has been released for almost all of the supported Apple devices including iPhone, iPad, iPod, AppleTV and AppleWatch. If you are already using iOS 11, it is pretty easy to upgrade to iOS 12. You can do it using your device’s update app or iTunes. If you decide to upgrade using iTunes, please note that you will require iTunes 12.9 for this purpose. Let’s first go through some of the striking new features introduced in iOS 12 and then we’ll move on to how to download and upgrade to iOS 12.
iOS12 runs very well even on older devices. It is not just created for expensive devices like iPhone XS, if you have iPhone 5S, the OS will run wonderfully well on the devices. iOS 12 introduces a new feature called Screen Time. Screen Time gives the user an overview of the device’s activities, the apps used by the user and how much time was spent on each app. You can also restrict using an app for a maximum of particular amount of time. For example, if you are addicted to Facebook, you can restrict Facebook app usage to one hour or two hours daily. Once you have reached the set time limit, iOS will let you know that the maximum allowed time has reached and will block the app. iOS 12 introduces stacked updates with respect to each application. This way, the notification list becomes a lot shorter and manageable. The new iOS lets you search by location, people, moments or memories. This will make photos management a lot easier. iOS 12 includes augmented reality apps by default. Now you can measure anything using the Apple augmented reality app. The only thing that you can’t measure in iOS 12 is your productivity :). Please note that Android also has some applications for measuring anything but it is not installed by default. One interesting feature for which users have been waiting was Group FaceTime. 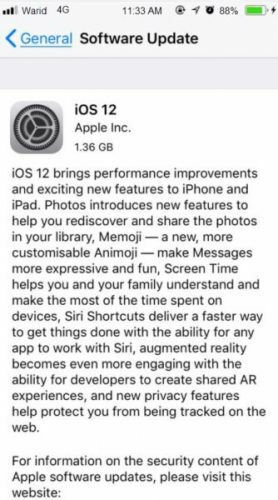 This feature has been delayed and is expected to be released in the minor version of iOS 12 coming next, iOS 12.1 or something. Before upgrading or down-grading, it is always important to take a backup of your important data. You can either backup your data to iCloud or to the local computer using iTunes. Since backing up data on iCloud is pretty straightforward, we will share how to use iTunes to backup your device locally. Under Summary, Manually back Up and Restore, click on the Back Up Now button. If you want to save Health and Activity data from Apple Watch, you will need the check “Encrypt iPhone Backup” before clicking the back up now button. Download iOS12 for iPhone XS?